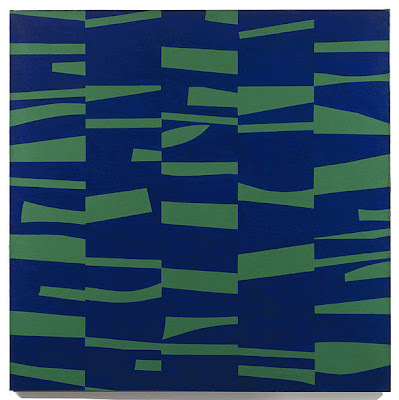 Ellsworth Kelly, The Meschers, 1951, oil on canvas, 59 x 59 inches, Museum Of Modern Art, New York. "All warfare is based on deception," said Chinese theoretician Sun Tzu in his definitive work on military strategy and tactics, The Art of War. No one knew this better than the 23rd Headquarters Special Troops of the World War II U.S. Army. This unit was chronicled in Friday's Book Patrol, in conjunction with an exhibit at The University of Michigan's Harlan Hatcher Graduate Library. The Ann Arbor library's display of memorabilia, photos, and art works will also include the screening of a rough cut Rick Beyer's documentary, The Ghost Army. The exploits of this unit of 1,100 men, so adept at visual and sonic skulduggery that they were mistaken by the Nazis for a phantom army of 30,000, are some of the most unusual and least known stories of World War II. But equally impressive are the creative individuals who made up the 23rd. Required to have an IQ of at least 119, and recruited from America's finest art, engineering, and design schools, these men combined their talents and brain power to become the P.T. Barnums of subterfuge. Many of them went on to achieve great fame after the war. All were forever changed by both their military service in Europe just after the 1944 invasion of Normandy, and the arts of deception and misdirection they perfected there. Many of the visual artists recruited into the 23rd specialized in creating camouflage. The Ghost Army artists primarily painted perfect patterns to disguise valuable weaponry. But bizarrely, they sometimes created calculatedly crummy concealment for the bogus inflatable weapons the unit used to draw fire away from the real thing. Future Hollywood actor and set designer George Diestel recalled a major drawback to being a camoufleur: "The trouble with camouflage is you really never know if it works, because you just simply don't get bombed. You only know if it doesn't work." In other words, this dangerous disguise duty was for the birds, or at least for a particularly artistic birdwatcher. 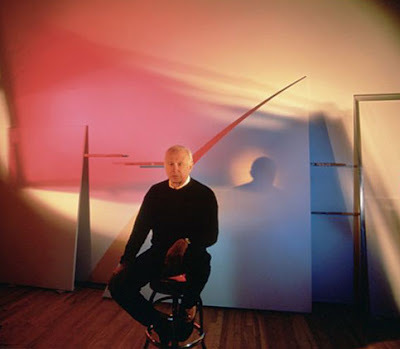 Artist Ellsworth Kelly Photographed By Richard Leslie Schulman. The man who became the most famous painter to graduate from the art school of The Ghost Army, minimalist Ellsworth Kelly, was introduced to birdwatching by his paternal grandmother at age 9. As a boy he was a quiet loner with a pronounced stutter, who spent much of his free time studying the ways in which birds blend in with their habitat. Kelly maintained that quiet contemplation of avians trained his eye to focus on shapes, forms, and colors, rather than lines. Kelly's paintings often utilize only two or three colors, the same number that typically occur in any one species of bird. He was influenced throughout his career by the greatest ornithological illustrator in history, John James Audubon. The source of Kelly's spare style presents one of those "chicken or egg" questions when analyzing the influence of his time in the 23rd on his aesthetic. Did his boyhood study of the protective coloration of birds make him a natural at creating convincing camouflage? Or did his time obscuring ordinance obliterate his interest in lines? Kelly once said of his painting: "I'm not interested in edges. I'm interested in the mass and color, the black and white. The edges happen because the forms get as quiet as they can be. When I work with forms and colors, I get the edge." He further explained:"By removing the content from my work I shifted the visual reality of painting to include the space around it." 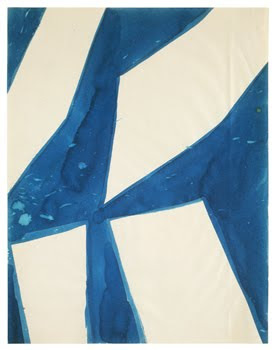 Ellsworth Kelly, Untitled 1957, Ink On Paper. That description sounds a lot like the whole idea of camouflage: to erase the boundaries of the object to be hidden, making it indistinguishable from its surroundings. Whether or not it was due to his time in the trenches, Kelly became a master of the use of shadow and form, forever fascinated by the construction and deconstruction of the visible. How Can We Know The Artist From The Art? 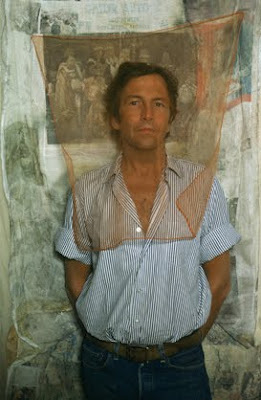 Portrait Of Robert Rauschenberg By Art Kane, 1974. Following the previous pattern, another of the 23rd's most distinguished alumni, photographer Art Kane, also had a boyhood fascination with animals, in his case reptiles. As "Arthur Kanofsky" of the Bronx, he was the first New York City Boy Scout to earn the Reptile Study merit badge, thanks to his collection of 32 pet snakes. His original ambition was to become an illustrator of fairy tales, creating serpent-influenced dragons, and other reptilian inhabitants of an imaginary netherworld. Drafted into the Ghost Army, his boyhood study of snakes served him in the same way as Ellsworth Kelly's birdwatching: he was familiar with rendering a species that silently slides unseen through its surroundings. Creating camouflage was a cakewalk for Kane. After the war, Kane served as an art director for Seventeen magazine, pursuing photography only as a sideline. But in 1958 fellow art director Robert Benton of Esquire magazine hired Kane to shoot his first professional photographs: a series of images on the history of jazz. 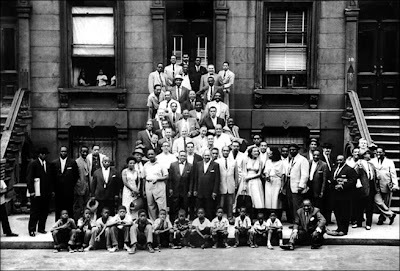 This led to the creation of what is arguably the most famous shot of jazz musicians in history, known as A Great Day In Harlem. A Great Day In Harlem by Art Kane, 1958. Kane attributed the creation of the iconic image to the fact that he was "young and naive." Instead of shooting portraits of individual players, he contacted every major jazz musician in New York City and asked them to show up at a brownstone on 126th street in Harlem at 10 am. Benton, among others, thought Kane was nuts to think jazz musicians would show up anyplace at 10 am. But amazingly, 57 premiere players including Thelonious Monk, Dizzy Gillespie, Count Basie, Charles Mingus, Gene Krupa, Maxine Sullivan and Sonny Rollins, put in a appearance. The complex logistics, brilliant composition, and historic importance of A Great Day In Harlem, made Kane's reputation as a portrait photographer, specializing in musicians. Art Kane went on to create arresting images of Bob Dylan, Jim Morrison, The Who, and the Rolling Stones. The influence of Kane's time in the Ghost Army on his photos can be seen in his integration of subject and setting. Unexpected angles, saturated colors, and a painterly use of color, texture, and form unify his body of work more than particular subjects. A Kane photograph presents an otherworldly image in which background and foreground become inseparable, completely unified as part of total sensual experience. Nothing is seen as it really is, or as the viewer thinks it ought to be, but somehow the work still taps into the collective unconscious, and resonates as a familiar archetype. Andy Warhol commented on Kane's laser-like precision: "Like the sun, Art beams his eye straight at his subject, and what he sees, he pictures." Ironically, in light of his time with the military's masters of deception, one of Kane's most famous commercial images was used for the only magazine advertisement of the DeLorean Motor Company. It was later reprinted in a book about the shadowy history of that company entitled Stainless Steel Illusion. 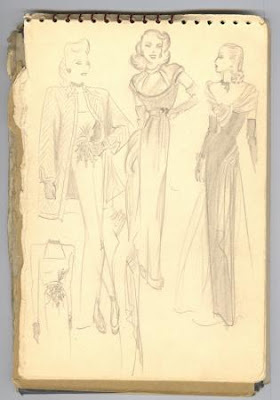 Fashion In The Foxholes: A Page From Bill Blass's Wartime Sketchbook, circa 1944. Despite the fact they became experts at camouflaging hardware, some of the creative types in the Ghost Army had a particularly tough time blending in. Gung-ho G.I. Joe's and off-beat aesthetes were the military version of oil and water. But one of the 23rd's oddest odd-balls was also one of its best liked members: future fashion designer Bill Blass. Rick Beyer, creator of the documentary film about the Ghost Army, remarked that even in wartime Blass cut "a glamorous figure," and was a favorite subject of sketches and photos by his fellow soldiers. One of his closest friends in the unit, and later a designer for the U.S. Foreign Service, Jack Masey, describes the defiantly debonair Blass as a "Great guy. Wonderful. Knew what he wanted, read Vogue in his foxhole. The rest of us were a bunch of slobs, but not Blass. He was always dressed to the nines." Another member of the 23rd, Bill Sayles, remembers him as always having a positive outlook: "[Blass] would never shirk a duty. If it was cleaning trash cans, he was right there with a smile and beautiful teeth." In his memoir, Bare Blass, the man himself explained: "For me, the three and a half years that I spent in the army represented absolute freedom. I was truly on my own for the first time in my life. So, naturally, in that exuberant state of mind, I didn't always notice how bad things were." 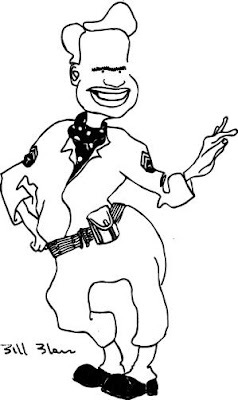 A 1944 Caricature of Stylish Soldier Bill Blass By His Friend and Ghost Army Comrade, Jack Masey. The man who became world famous for designing racy yet elegant sportswear, blending softly feminine details with impeccable menswear tailoring, was his own finest creation. Before anyone had ever imagined The Ghost Army, he used its tools of trickery to disguise his own middle class, Midwestern origins. When Blass was five, his father died from "a self-inflicted gunshot wound in our front parlor." From that time he cultivated a "budding genius for avoiding anything unpleasant or ugly." He began making sketches of glamorous, sophisticated socialites inspired by elegant film-star fashion plates like Carole Lombard and Claudette Colbert. In the yearbook of his Indiana High School, Blass said his greatest ambition was "to get out." His classmates voted him "the best dressed and least likely to succeed." They were half right. He was already making money from his fashion designs when he arrived in Europe to join the 23rd, courtesy of Uncle Sam. While other soldier-artists sketched their war-torn surroundings, Blass filled his notebooks with "drawings of ladies' hats, shoes, gloves, and dresses," and with doodles of the mirrored "B"s that became his logo." Bill Sayles recalled there was a practical side to this unlikely pass time:"He would sit on a bunk bed on Saturdays and Sundays, and he would do little thumbnail sketches of clothes. He would, in two half-days, do about 300 to 400. Then he'd wrap it up, send it down to Buenos Aires, or Rio de Janeiro. He had some contacts there. And they would pay him $2 apiece. He did pretty good." Blass later laughed that his World War II heroics consisted of "painting, sewing, impersonation, and dreaming up marvelous new uses for chicken feathers." 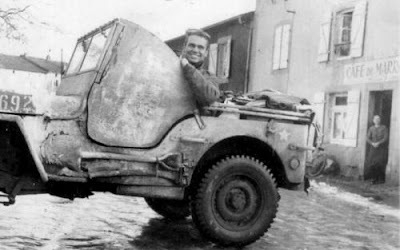 Never Without A Smile: Bill Blass, Europe, 1944. 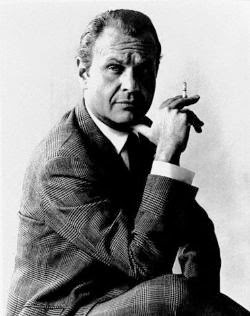 Bill Blass: The Personification Of Style, Not Fashion. A statement Bill Blass once made about his industry could double as a tribute to the singular artist/soldiers of the Ghost Army: "Fashion can be bought by anybody; style takes discernment. It has to do with individuality.'' One thing is for sure: no Army unit in history ever contained more stylish individuals than the 23rd Headquarters (Very) Special Troops.